Goodreads Synopsis: Madeleine Kuderick’s gripping debut is a darkly beautiful and lyrical novel in verse, perfect for fans of Sonya Sones and Laurie Halse Anderson. Kiss of Broken Glass pulses with emotion and lingers long after the last page. In the next seventy-two hours, Kenna may lose everything—her friends, her freedom, and maybe even herself. One kiss of the blade was all it took to get her sent to the psych ward for seventy-two hours. There she will face her addiction to cutting, though the outcome is far from certain.When fifteen-year-old Kenna is found cutting herself in the school bathroom, she is sent to a facility for mandatory psychiatric watch. There, Kenna meets other kids like her—her roommate, Donya, who’s there for her fifth time; the birdlike Skylar; and Jag, a boy cute enough to make her forget her problems . . . for a moment. Dark. Lyrical. Haunting. Kuderick's novel, Kiss of Broken Glass, was also quite a snooze fest. The novel had some golden scenes but having it been such a short book it lacked a developed protagonist and the plot was overtaken by the poetic writing style. 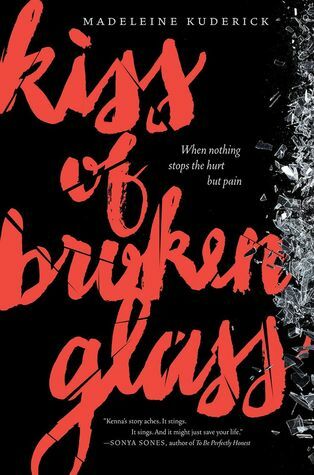 In Kiss of Broken Glass, we meet Kenna who is admitted into a psych ward for 72 hours because of her cutting. The Baker Act of Florida involuntarily forces teens who cut to seek care and help, and readers are able to see that in Kenna's story. The novel "delves" into Kenna's currrent situation with her family, friends, and herself. Within the 72 hours, Kuderick explores Kenna's journey in and out of the ward, and how she deals with her emotions and cutting. I really enjoyed Kenna's journey and the raw emotion Kuderick was able to weave throughout the book. With that being said, I also felt like Kenna's story and family/friend dynamics were not as developed. I just wished Kuderick wrote more and got rid of the poetic writing she was trying to use. It ultimately caused the book to feel short and boring. What I did admire from the book is the message. The writing was raw and full of emotion, you can get a sense of the emotions and conflicts Kenna was dealing with in the novel. At the end of the book. Kuderick was amazing to have hotlines and website for teens dealing with cutting and self-infliction. She was able to get the word out that cutting in general only leads to pain and suffering and Kenna's story was a canvas to say that. Ultimately, Kiss of Broken Glass had many great moments in the novel to Kuderick's wonderful writing. But it did fall because of the shortness of the novel and the poetic writing style. That's unfortunate. It sounds like a relevant read with social and psychological issues that need to be addressed. It's something that I have a hard time getting through on a good day, so I don't know if this book is for me.